^ "Radio-Radar Telescope Will Probe Solar System". Electrical Engineering. 80 (7): 561. July 1961. doi:10.1109/EE.1961.6433355. Retrieved July 31, 2016. ^ "UCF-led Consortium to Manage Arecibo Observatory in Puerto Rico" (Press release). UCF Today. February 22, 2018. ^ a b "Good news, earthlings! Puerto Rico telescope still guarding the galaxy despite Maria". Miami Herald. October 23, 2017. ^ David Brand (January 21, 2003). "Astrophysicist Robert Brown, leader in telescope development, named to head NAIC and its main facility, Arecibo Observatory". Cornell University. Retrieved September 2, 2008. ^ "General Views of the Arecibo Observatory". Image Gallery. Arecibo Observatory. Retrieved August 25, 2013. 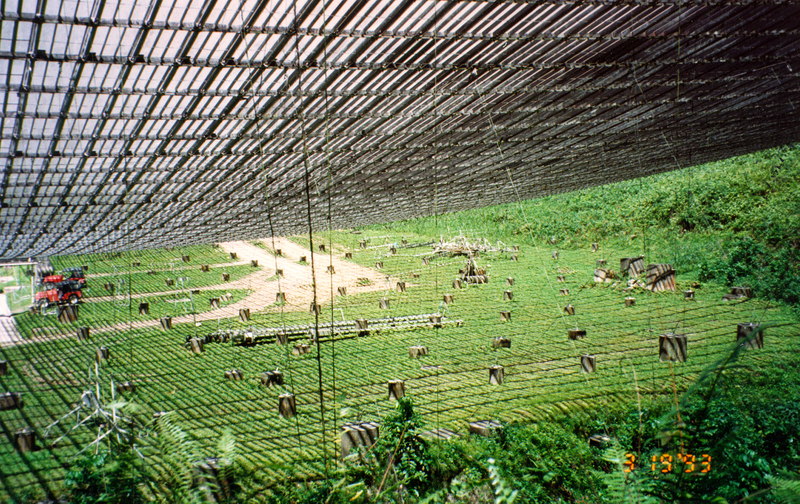 ^ "IEEE History Center: NAIC/Arecibo Radiotelescope, 1963". Institute of Electrical and Electronics Engineers. Retrieved September 2, 2008. ^ "Pictures of the construction of Arecibo Observatory (start to finish)". National Astronomy and Ionosphere Center. Archived from the original on May 5, 2009. Retrieved May 5, 2009. ^ "Arecibo Observatory". History.com. Archived from the original on March 14, 2009. Retrieved September 2, 2008. ^ "Asteroid 4769 Castalia (1989 PB)". NASA. Archived from the original on September 16, 2008. Retrieved September 2, 2008. ^ Staff (January 15, 2008). "Life's Ingredients Detected In Far Off Galaxy". ScienceDaily. ScienceDaily LLC. Archived from the original on April 21, 2008. Retrieved March 29, 2008. [Article] Adapted from materials provided by Cornell University. ^ Robert Roy Britt (December 20, 2001). "NASA Trims Arecibo Budget, Says Other Organizations Should Support Asteroid Watch". Space.com. Imaginova. Archived from the original on December 5, 2008. Retrieved July 8, 2008. ^ Blandford, Roger (October 22, 2006). "From the Ground Up: Balancing the NSF Astronomy Program" (PDF). National Science Foundation. Archived (PDF) from the original on June 26, 2008. Retrieved July 7, 2008. ^ Weiss, Rick Weiss (September 9, 2007). "Radio Telescope And Its Budget Hang in the Balance". The Washington Post. Arecibo, Puerto Rico: The Washington Post Company. p. A01. Retrieved July 8, 2008. The cash crunch stems from an NSF senior review completed last November. Its $200 million astronomy division, increasingly committed to ambitious new projects, but long hobbled by flat Congressional budgets, was facing a deficit of at least $30 million by 2010. ^ "Congress gets bill to save Arecibo Observatory". Cornell University. October 3, 2007. Archived from the original on October 8, 2007. Retrieved September 4, 2008. ^ "SRI International to Manage Arecibo Observatory" (Press release). SRI International. July 10, 2013. Retrieved July 10, 2013. ^ "Dear Colleague Letter: Concepts for Future Operation of the Arecibo Observatory". October 26, 2015. Retrieved November 11, 2015. Ruiz, Carmelo (March 3, 1998). "Activists protest US Navy radar project". Global Network Against Weapons and Nuclear Power in Space. Archived from the original on May 1, 2001.